This is one of a group of five unfinished sketches from Samuel Cooper's studio which survive in the Royal Collection. The remaining miniatures in the group show Catherine of Braganza (420644), Barbara Villiers, Duchess of Cleveland (420109), James Scott, Duke of Monmouth and Buccleuch (420645) and Frances Stuart, Duchess of Richmond (420085). The artist would have worked up these sketches directly from the sitter, possibly with a view to completing them if further commissions were forthcoming. A finished version of this sketch, signed by Samuel Cooper, is in the Buccleuch Collection. Although it bears no date, it shows the Duke wearing the ribbon Order of the Garter, which was bestowed on him in 1660, making it likely that the present sketch dates from around this time. 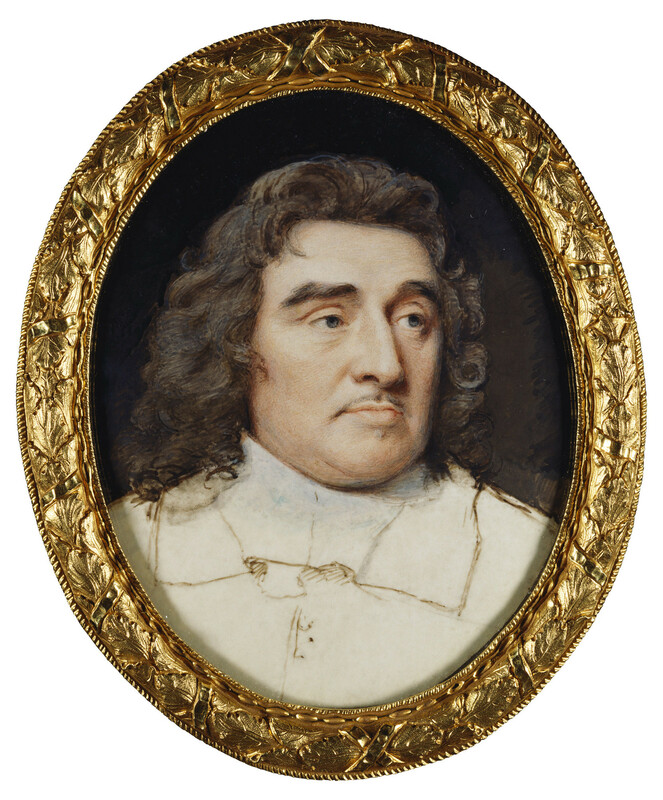 Cooper's miniature of the Duke of Albemarle was observed by Samuel Pepys in the artist's studio when he visited Cooper's house in March 1668. Cosimo III de' Medici saw it there a year later, and praised it, with another sketch in this group, for its spirited execution and charm. Cosimo also noted that ' in each case the portrait was to the knee' and it has been argued that all the sketches in the group were cut down from three-quarter-length rectangular format to smaller ovals at an early stage, possibly while they were still in the possession of the artist's widow. George Monck, 1st Duke of Albemarle, son of Sir Thomas Monck of Torrington, made his name as a general during the Civil War. In 1654 he took command of the army in Scotland and it was his support for Charles II and march to London with his forces which led to the Restoration. An Italian commentator described him in 1670 as: '.. of the middle size, of a stout and square-built make, of a complexion partly sanguine and partly phlegmatic, as indeed is generally the case with the English; his face is fair, but somewhat wrinkled with age; his hair is grey and his features not particularly fine or noble'.